Well it is almost the end of summer, and has it ever gone by fast this year! Doesn’t it do that every year though? Winter here comes very quickly upon us, and it is long. So I am trying to have my children outdoors as much as possible right now. They love being outside. They also like picking up things they find while playing at the park or in the yard. We have really gathered quite the collection of rocks this year! We like to create with our nature finds, including pressing flowers, and making designs with paint and leaves. I also love making nature collages with them; they’re loads of fun and can be a great learning experience. What do you need for a nature collage, you may ask? Anything your child can find and pick up is fair game as long as it’s not a live animal, poisonous, or otherwise hazardous to their health. Twigs, neat pebbles or small rocks, pinecones, weeds, leaves, and small flowers are common items children like to pick up. If your children want to use leaves off the ground, or if they find bird feathers, empty nests that have fallen from trees, or chewed-on nut shells, they’re fair game. Don’t forget to bring along a bag so your child has someplace to carry their new found treasures! Some boys from my daughters’ class – at play in the great outdoors during a class camping trip. Where can your child find all of these neat items for their collage? Your own yard is a great place to begin. They may also find them at parks, along lakes as long as an adult is walking with them, or walking in their own neighborhood. Anywhere you can find items in nature is a good place to look. Other benefits of looking for these treasures is that it provides good exercise and gets your child out in the sunshine and fresh air. Now you may be wondering what to do with all this great ‘stuff.’ Find a sunny spot in your yard such as a picnic table or spread a blanket in the grass. Let them dump the contents of their bag out onto a surface and look carefully at each item. If you have a magnifying glass, so much the better! Ask them about what each item came from. If they found a leaf, do they know what type of tree it came from? What color is the flower or feather they found? Does it have a smooth surface or is it rough? Gather together the items they want to use for their collage, several sheets of heavy duty paper like cardboard or poster board, and some tacky glue. Next help them arrange the items on the paper and then glue them down. If you have a larger piece of cardboard or poster board, you may want to glue it to the back of their original. This will give you a place to write their name, their age, and the date so they, and you, will remember the day. When everything has dried and there’s no chance it will fall off, don’t forget to display their nature collage where everyone can see it. Making a nature collage with your child is a great way to get them outside and begin teaching them about the world around them. Your child may love making nature collages so much that they ask you regularly and often to come with them and help them find new items with which to create their fabulous works of art! 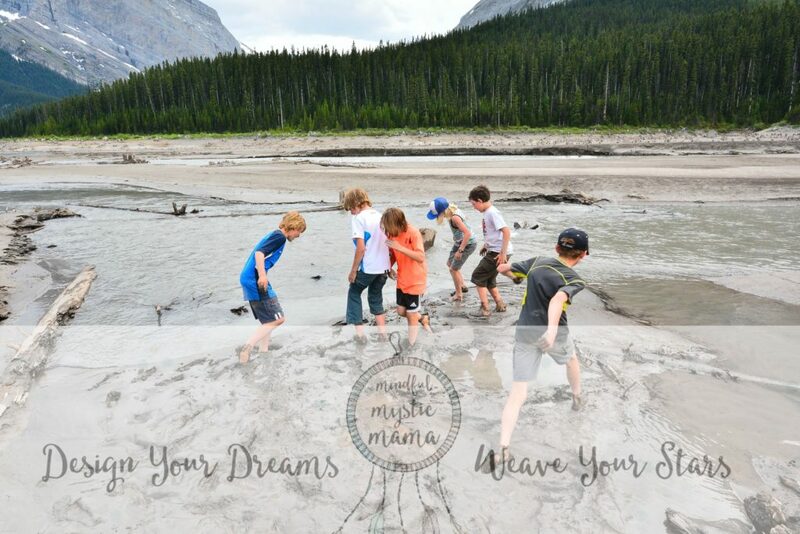 Encourage their love of nature and you’ll encourage their love of learning. Want to try out a fabulous nature coloring book, in the event that the weather doesn’t permit an outdoor adventure? A Walk in the Woods is one of the best out there. What a great idea, I have done this with my kids and collecting the leaves was our favorite part. 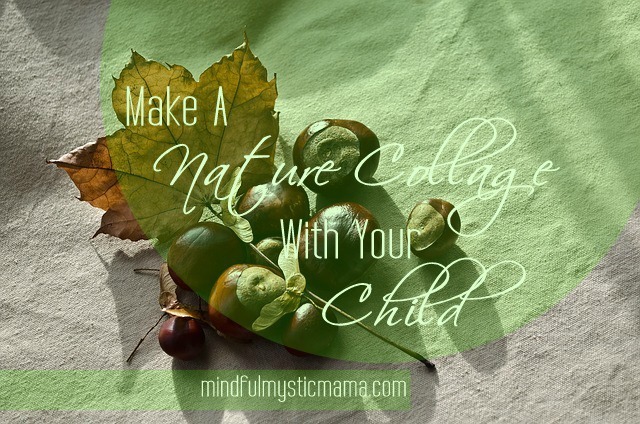 I used to make nature crafts with my kids all the time, we got out of it or some reason I don’t know why… But I kind of miss it, may have to use your ideas! This is such a fun idea for all ages! I would love doing one of these especially with fall around the corner! This is the perfect fall project to do as a family. Fall is my favorite time of year and I love doing projects with leaves. Fun!! We’ve done a nature collage before. I like the idea, it’s a great way to spend time with the kids too! We have done this several times – great reminder to do it again ! This would make a teacher feel so special and appreciated!